The 9th U.S. Circuit Court of Appeals ruled Sept. 18 against the Northwest Resource Information Center, an Idaho-based environmental group that claimed the Northwest Power and Conservation Council short-changed the region's fish and wildlife in its latest power plan, completed in 2010. However, the three-judge panel also ruled that the Council had made two procedural errors that must be corrected. The decision, written by Judge Ronald Gilman, a visiting judge from the 6th U.S. Circuit Court of Appeals (Memphis, Tenn.), gave short shrift to several arguments by Council attorneys who tried to support its claim of due consideration, but the Niners did rule the Council rightly interpreted the Northwest Power Act, and the NRIC did not. "The Power Act's due consideration requirement is aimed specifically at new power-resource acquisitions, not at existing resources. This is reflected in the statute's requirement that "[t]he plan shall set forth a general scheme for implementing conservation measures and developing resources pursuant to section 839d ... with due consideration by the Council for ... protection, mitigation, and enhancement of fish and wildlife." The NRIC was represented in court by Earthjustice, which had argued that the region actually had more leeway with power needs than the Council had articulated, and that dam operations more beneficial to fish could have been added. Earthjustice released a statement after the decision that noted "the Court had found that the Council's previous program [5th Power Plan] 'underestimated the degree to which the region could accommodate fish and wildlife measures while maintaining an adequate power supply.' While the Court did not require the Council to revisit that decision, it noted that the 'substantial increase' in the amount of available energy conservation 'should nonetheless be relevant to fish and wildlife planning.'" "No one can argue that the Council has achieved the fish restoration requirements of the law -- 13 of these stocks are on the Endangered Species list," said Earthjustice attorney Steve Mashuda. "While we believe the Council should have complied with its restoration duties when it adopted the Sixth Power Plan, the Court's decision provides clear direction for the Council to follow as it develops its new fish and wildlife program over the next year." Mashuda did not explain why his argument didn't convince the three-judge panel. "But articulating a retroactive approach that the Council chose not to follow is insufficient to meet NRIC's burden of showing that the Council acted in a manner that was 'arbitrary, capricious, an abuse of discretion, or otherwise not in accordance with law,'" said the ruling. "NRIC has not pointed to any part of the Power Act that requires the Council to reconsider fish and wildlife measures in light of its evaluation of the regional power system from the subsequent power-planning process. Absent such a showing, we will not second-guess the due consideration that the Council gave to fish and wildlife interests in the adoption of the Plan." Public power advocates applauded the ruling. "Actually, on the substantive issues, the court clearly rejected the petitioners' arguments," said Scott Corwin, executive director of the Public Power Council. "It is clear that the remand here relates to limited procedural matters. Trying to extrapolate this decision into a push to expand the program, or ignore the significant costs of the program, is a misleading rhetorical overreach." The decision did say the Council had erred by not including its cost/benefit methodology in the draft plan, so no public comments were collected on that issue. But the Council did include the methodology as an appendix to the final plan, and acknowledged the error in its briefing, but said it considered the error "harmless." The Niners, however, did not. They said the Council's argument was not convincing -- that the final product would not have been substantially different even if public comments had been received. "For this reason, we will remand the Plan to the Council for the limited purpose of adopting a methodology through the appropriate notice-and-comment process," said the court. The Niners also said the Council had given no adequate explanation for why it had used a smaller number for F&W costs in its draft of the power plan, but a larger one in the final plan that included BPA's foregone revenues from operations for fish. "The Council provides no reasoned basis, either in the record or in its brief, for why it eliminated the lower resource-replacement cost estimate but mentioned the BPA's higher market-rate estimate multiple times." The Court said the Council must explain why it included one estimate and not the other in its final plan. Judge Sandra Ikuta dissented from the last part of the ruling, saying the Court had no legal basis for requiring the Council to edit out BPA's F&W cost estimate. "Given that the Council did not rely on the BPA's cost estimate, but merely quoted it, there is no basis for reversal regardless whether NRIC thinks the estimate is bunk," wrote Judge Ikuta. "In short, despite the majority's editorial zeal, a federal court cannot strike down a sentence in an agency's report because it does not like its spin." A brief filed in the lawsuit by NPCC attorneys in late 2012 said the NRIC may differ in its opinion whether current flow and passage measures for fish were sufficient, but those concerns should have been raised during the amendment process to the Council's F&W program, which was completed in 2009. The NRIC had a chance to challenge those elements within 60 days of the F&W program's adoption, but did not. But on April, 14, 2010, NRIC director Ed Chaney, a long-time supporter of breaching lower Snake dams, spoke before the Council meeting in Boise, after the body had approved the last two elements of the Sixth Power Plan. 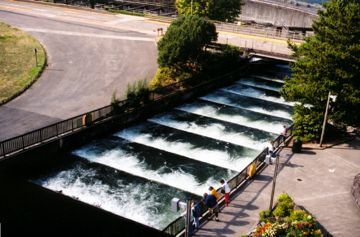 He told the Council that there was still no effective plan to restore fish and alleviate adverse impacts from the dams. "The Sixth Power Plan was creative," Chaney said, according to meeting minutes, "but it ratifies giving economic benefits to the Columbia River Pork Alliance that is responsible for destroying, not saving, the salmon."